New on Twitter and having difficulty to manage the activities? Or you have spent enough time with your Twitter account but still can’t succeed to get the desired outcomes? In both scenarios, this article will be fruitful enough for you. When it comes to social media, you have to be proactive to obtain the maximum output. Either you have to follow a story or response to any urgent query. There will be several situations occur in daily life where you find yourself in need to have an automate system to aid you in social activities. There are several social media management tools available in the market. The veteran entrepreneurs are using such software to manage their social media tasks. Such sort of applications eases their users to perform the marketing phenomena in more accurate ways. 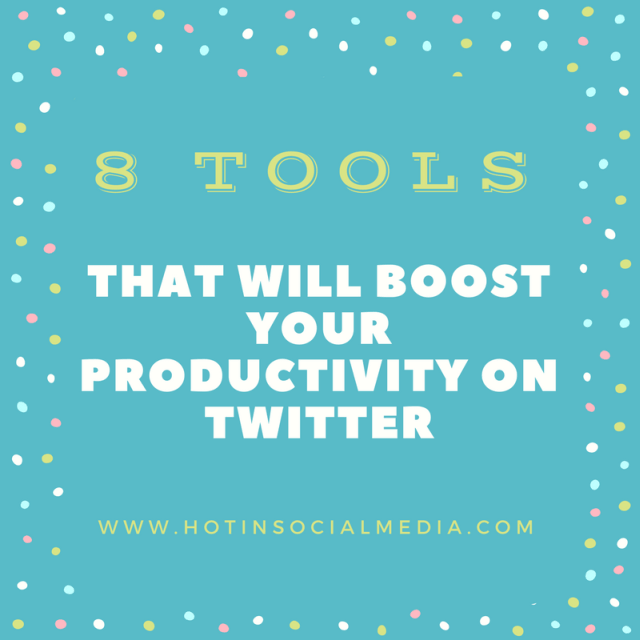 Below in this article, you find the techniques that will boost your productive on Twitter. At the first site, you might think that Bit.ly is just URL shortening app. But the fact is, it is used by some of the top marketers for handling their Twitter activities. The free version of Bit.ly will provide access to a dashboard from where you can easily manage to post links on several accounts. This app also eases you to analyze the stats of the links that you post by using this app. Bit.ly also provide an opportunity to customize the domain name of your brand to resemble the top brands like tradus.com to trad.to and jabong.com to jab.to. HootSuite is one of the most famous software in the means of social media management. Top social media elites have also used it. The HootSuite is available in free version. But you can’t manage more than five Twitter accounts with a free version. The paid version offer you to manage more than five accounts at once. It also aids to perform in-depth analysis of online activities. The paid version of HootSuite is also available for just five US dollar for a month. Paper.li is a unique social media tool. It gathered the tweets and aligned them in the similar pattern like a newspaper. The interface of this application is very interactive, and it helps to set the priority of the tweets according to your desire. Paper.li is the most suitable application to manage the various Twitter account. Paper.li is also helpful to generate and control the traffic. This application allows managing your Twitter account in the smarter way. Buffer ease you to schedule the bulk of your emails in a stack. You set the date and time whenever you want to send the mail. Moreover, you may also adjust the schedule for received mail. In this way, you do not have to go through the each and every mail inside your inbox. The emails will automatically spread according to their schedule. That’s how Buffer eases you to manage your time more precisely. This tool may also aid you to perform analysis, so you will also be able to understand the ongoing and upcoming trends of the market. Triberr ease you to find and join the related community to get modern business ideas and enhance your reach around the Twitter. All you have to do is to plug the RSS feed, and the new updates will automatically be accessed. Being the member of the community, you may also filter the tweets and also set the restriction that only be added in your feeds upon your approval. For the best results, you must have to authenticate the feeds. This tool is specially designed for the business firms to manage the activities relate to their social events. Co-Tweet offers the facilities of engaging, tracking and analyzing the conversations of related to their business. The free version of this application offer you to manage several Twitter accounts, interactive with numerous users, track your clicks, schedule your activities and analyze the history of your activities for a month. The premium version of CO Tweet eases you to perform in-depth analysis, control permissions and workgroup management. TweetDeck is much similar to the HootSuite application. The only difference is that TweetDeck is available in a desktop version. TweetDeck is also a handy tool to differentiate and organize your Twitter activities. It allows you to send longer texts more specifically. TweetDeck has a fantastic interface as well but, as it is available in a desktop version. So, a person that have to work on more than one system will need to install different packages on every device. TweetFeed ease you to integrate your social media accounts with each and hence you will be able to share your RSS feed automatically on Twitter, Facebook and all other social media. Whenever you share any feed, it will appear as a new update. You may also customize your feeds to reshape your new tweets through TweetFeed.